Construction Claims Management – Typically construction projects involve many resources such as labors, subcontractors, equipments and materials. Lack of coordination and communication between the project team and the vendors may cause disputes during the execution of the project. A number of issues such as unclear scope definition, poorly defined initial requirements and lack of stakeholder involvement are the most common reasons of disagreements between the parties. A claim is a demand for something due which results from an action. Claim is different than change order. A change order is an agreement between the parties however, claim is a request by one party. The claim becomes a change order if the parties agree. If the claim does not come to an agreement, it may proceed to negotiation, mediation, arbitration, and litigation phases until it is resolved. Construction claims management is an indispensable process in today’s projects that involve many resources and parties. One of the most effective claims management technique is to avoid claims in the early phases of a project by eliminating the root causes of problems. For example a well defined technical specification for a material prevents issues during the execution phase. It is always easier and cheaper to resolve the issues between the parties at early stages. As the construction project progressed, changes may become costly and difficult. Claim management needs effective practices during the entire life cycle of a project. Typically a construction project has four basic phases. Pre Tender : Preparation of concept design and contract documentations. Contract Formulation : Preparation and submission of tenders and contract signing. Post Completion : Completion of the project. Most of the disputes arise during the construction phase. However the root causes of the disputes are borned in the pre tender and the contract formulation phases. So that it is possible to prevent most of the claims during these phases. Construction phase makes disputes unavoidable because of it’s nature. Clients, stakeholders, project teams and subcontractors have various requirements. Many people think that claims originate from contractors needs and contractors often make claims against the client. However claims may originate from the client’s requirements. In a claim management process, there are two parties. One is making the claim and the other is preventing against it. In construction an additional work or an extra to the contract is subject to a claim. The Claim Prevention phase starts with the initial contract documentation. The most effective way to prevent claims is to create all contract documents, plans and designs in the same line. During the construction phase it is not possible to avoid all the claims but it is possible to mitigate claims from arising. Well defined responsibilities, good communication channels, effective risk management and decision making are helpful to mitigate claims. The Claim Pursuing phase includes two subheadings which are Claim identification and Claim Quantification. Claim identification is to identify the possible claims by analysing the contract documents such as scope of work, contract terms, extra work descriptions etc. Claim quantification is to calculate the cost and schedule impact of the claim by analysing the schedule and cost estimation documents. Once the claim is identified and quantified, claim resolution phase comes into action. Negotiation between parties is the best solution of claim. If the claim is not resolved by negotiation, it will proceed to mediation, arbitration, and litigation phases. In a construction project, claim prevention can be done effectively during the bidding and design phases. Well created contract documents and design files offer great opportunity for construction claims prevention. Once the construction phase begins, claim prevention becomes difficult. Although the impact of claims can be minimized with an effective project and contract management, claims may arise from disputes. 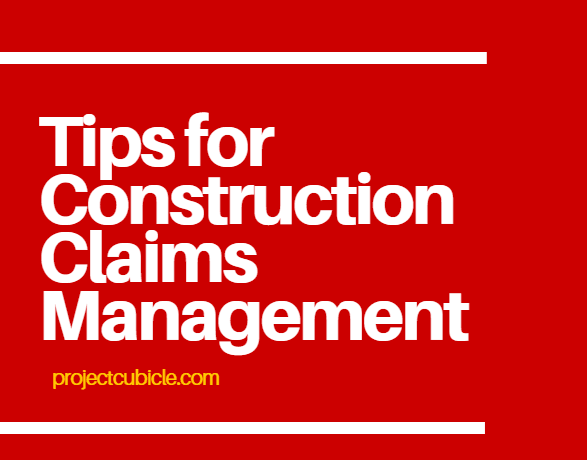 In case claim occurence, effective construction claims management must be done in order to avoid potential losses. The following recommendations can be used for an effective construction claims management process. 1. Review the claim file and supporting documents prepared by contractor and specify the legal basis of the claim. 2. Perform a site investigation and collect information about utilities, soil conditions, subsurface conditions, general site conditions, labor,weather, material, equipment and other related items. 3. Analyze the proof submitted by the contractor and decide if it is adequate or not for the assertion. 4. Review the breakdown of the contractor’s bid. 5. Underline the requirements mentioned in the contract for claim preparation and determine the sufficiency of the documents submitted by the contractor. 6. Review the site reports, records, documents to obtain a detailed understanding of the facts. List the facts which can be confirmed or refuted and determine the additional proofs that are required to support the Contractor’ s claims. 7. Compare the current schedule with the one submitted by the contractor in the claim file. Analyze the activities and determine the similarities and the discrepancies. 8. Assemble a meeting with the contractor and underline the statements to support factual analysis. 9. Make productivity analysis of the Contractor’ s supporting documentation and compare it with the actual performance records. 10. Calculate the overhead costs of the contractor by using daily reports. 11. Determine strengths and weakness of the claim. 12. Prepare an action plan for managing and resolving the issue. Unlike other industries, construction disputes have their own characteristics. Therefore, conflict resoulution techniques differ from other industries. The parties involved in any construction project may have conflicts even if they have the same goal. Effective claim analysis and prevention practices are essential for securing projects from damanges. I like your tip about calculating the cost. That makes sense considering you want to stay within your budget. I’ll have to consider your tips so that I can stay ahead of schedule.